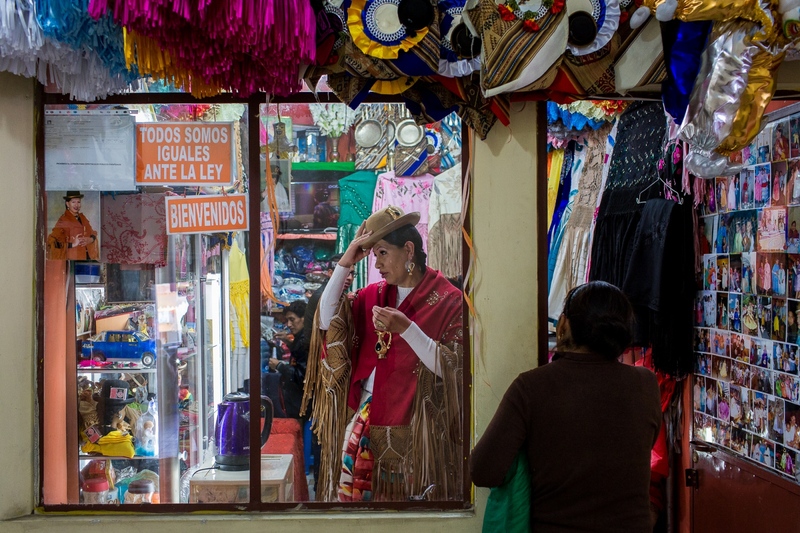 As recently as 10 years ago, Bolivia’s indigenous Aymara and Quechua women were socially ostracized and systematically marginalized. Known as “cholitas” (an initially derogatory term which members of the community have re-appropriated and now use with pride), these women—recognizable by their wide skirts, braided hair, and bowler hats—were banned from using public transportation or entering certain public spaces. Their career opportunities, meanwhile, were severely limited, with most becoming either housecleaners or roadside vendors. 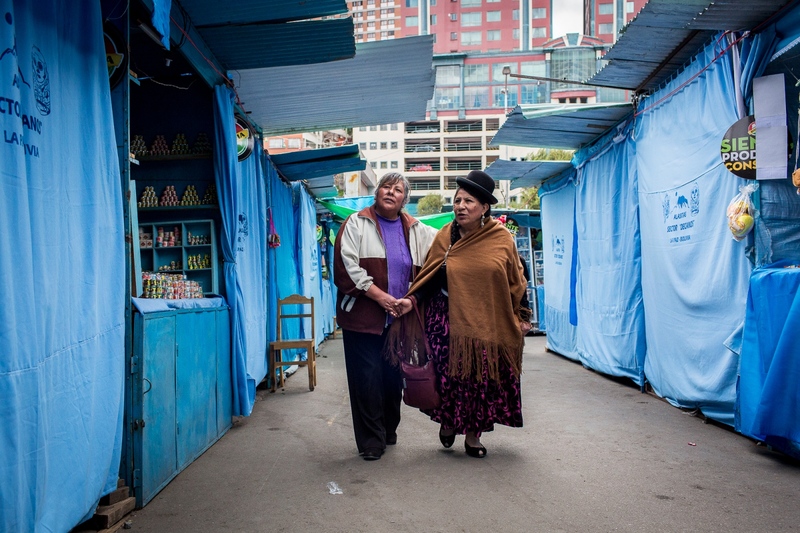 While these women have been organizing and advocating for their rights since at least the 1960s, their movement was invigorated by Evo Morales’s election, in 2006, as Bolivia’s first indigenous president. 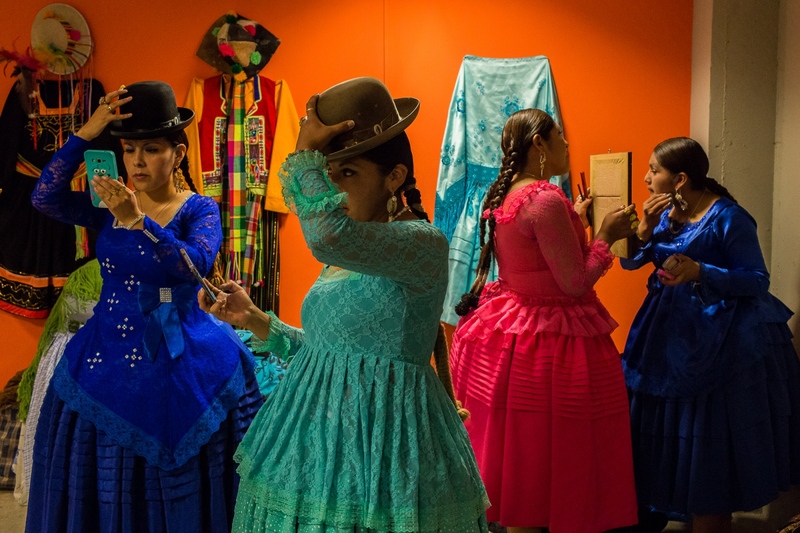 Ever since that historic moment, many of the country’s “cholitas” began taking pride in their traditional identity and further asserting their rights as members of Bolivia's society. Portraying their accomplishments not only is a way to celebrate their success but also a way to inspire others to follow their path not only in Bolivia but also in other countries around the world where women suffer the same discrimination and unequal opportunities that the indigenous women of Bolivia once had and in many cases still do. Bertha Acarapi looks over the city of La Paz from the backyard of ATB Television studios in El Alto. Bertha is a journalist for the national television network ATB. She was the second indigenous woman ever to work in television in Bolivia. The opportunity to work in media came after she won a pageant contest in the city of El Alto. Bertha has a Master’s degree and served from 2000 to 2005 as alderwoman for the El Alto municipality. Remedios Loza in her office at Radio Andina in La Paz. Comadre Remedios as Loza is known as a pioneer for “cholitas’ rights.” In 1962, she became the first indigenous woman to have radio and TV programs, and she used these platforms to give voice to the indigenous and to poor people. 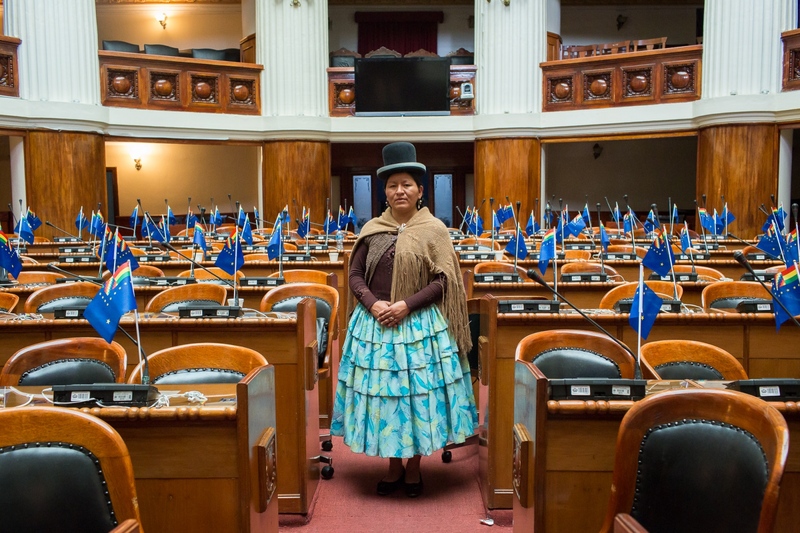 In 1989, she became the first indigenous woman to have a seat in Bolivia's Plurinational Legislative Assembly. In 1997, she became the first woman to ever run for Bolivia’s presidency. 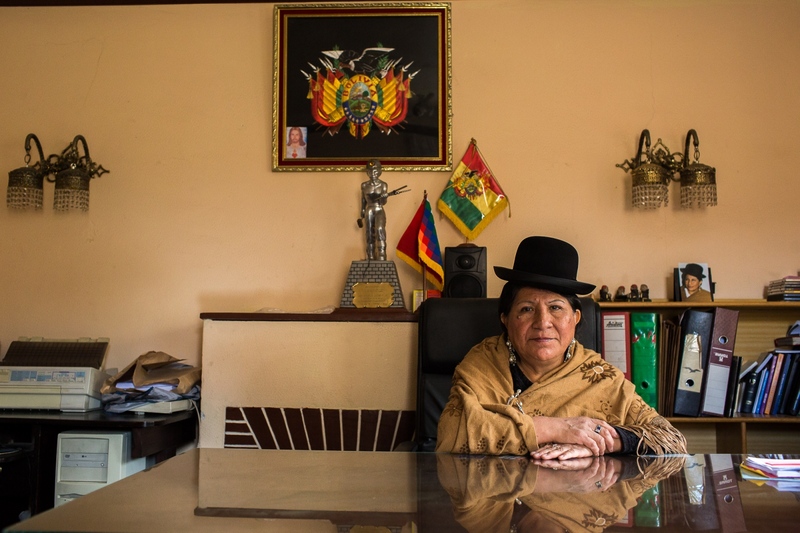 She came in third; but fewer than 10 years later, her movement helped elect Evo Morales as the country’s first indigenous president. Remedios Loza walks with an admirer through an alley of the Alasitas handicraft market, La Paz. Comadre Remedios as Loza is known is revered by other women and consider a pioneer for indigenous women rights. 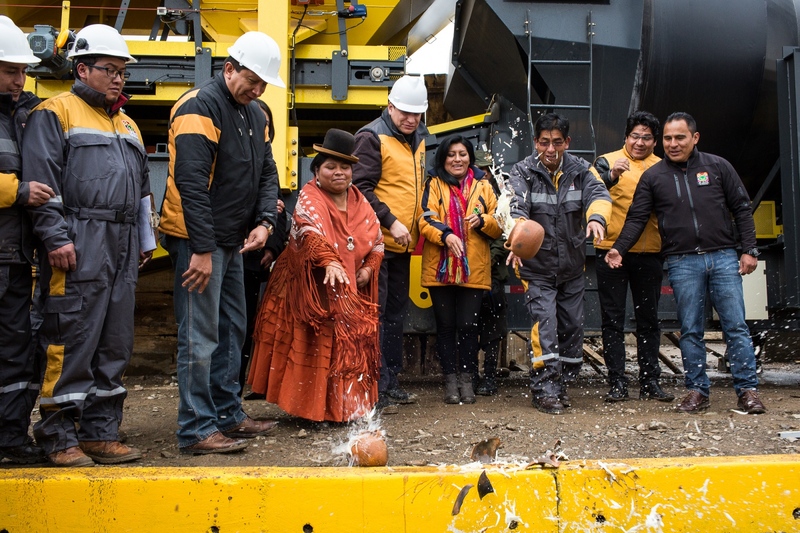 Alderwoman Reveca Sangali and Mayor Soledad Chapeton baptize an asphalt plant in El Alto. After 15 years of abuse—during which Reveca often had to sell merchandise on the streets in order to feed her six children—and an attempt on her life, she left her husband with the children and restarted her life. Through a friendship with the mayor, Reveca slowly became involved with politics, and in 2015 she was elected to a municipal office. Congresswoman Cristina Paxi at the Plurinational Legislative Assembly in La Paz. After hearing countless times that women couldn’t be elected to high office, Paxi decided to prove that they could. She ran for a seat in the Legislative Assembly’s Chamber of Deputies in 2014 and won. In truth, more than half of the Legislative Assembly’s members are women, a proportion which is second only to Rwanda. 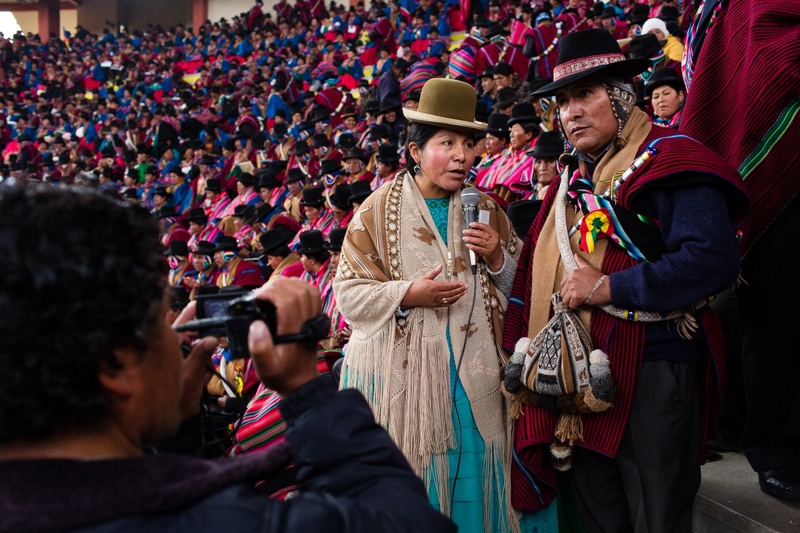 Sonia Sinani interviews Mr. Ajacopa, who was chief of the Ingavi Province during the Tupac Katari Indigenous Congress in El Alto. Sonia is a television and radio journalist. 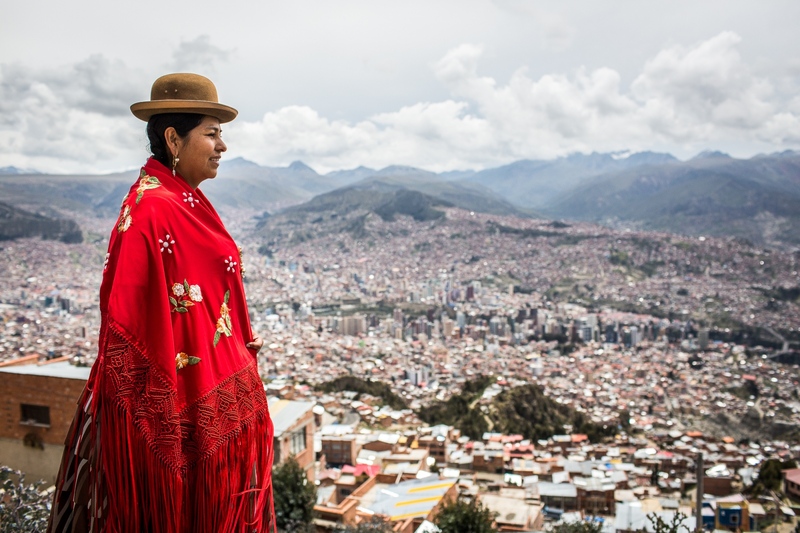 Her programs are entirely in Aymara, one of Bolivia’s indigenous languages, and they seek to elevate and celebrate Aymara culture—both of which, she says, are in danger of fading into extinction. 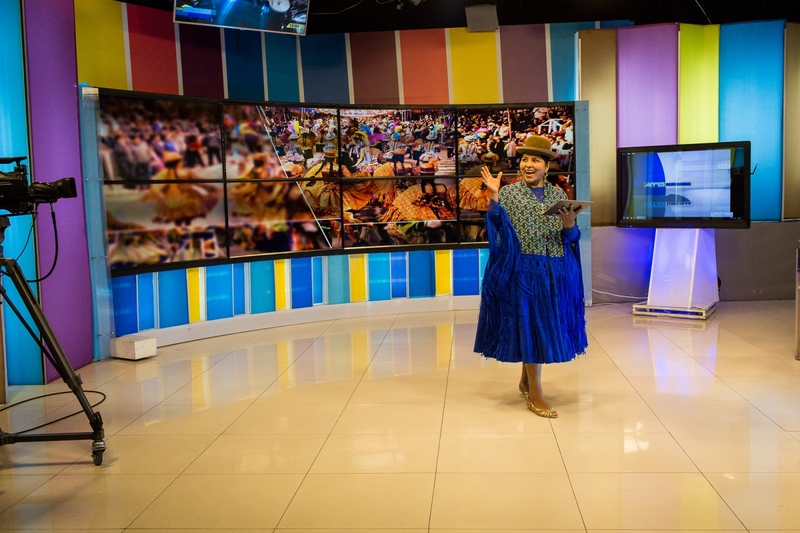 Bertha Acarapi during the news broadcast at ATB Television studios in La Paz. Bertha was the second “cholita” woman to work in television in Bolivia, following the trail blazed by Remedios Loza. 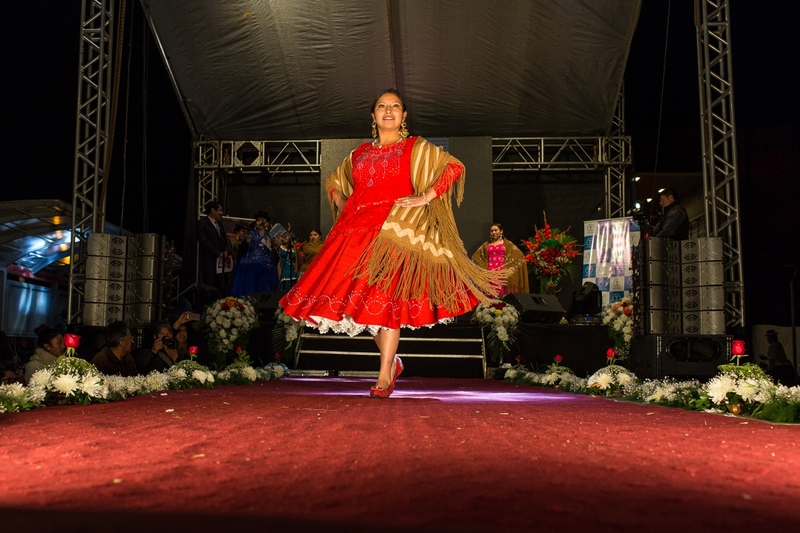 The opportunity to work in the media came after she won the Cholita Altena, a pageant contest in the city of El Alto. Bertha has a Master’s in public management and from 2000-2005 she served as alderwoman for the El Alto municipality. Bertha believes that the women of Bolivia don’t know about their rights, and she supports some kind of campaign to raise public awareness. Yolanda Mamani at Deseo radio station studio in La Paz. Yolanda is a feminist, activist, communicator and cleaner. 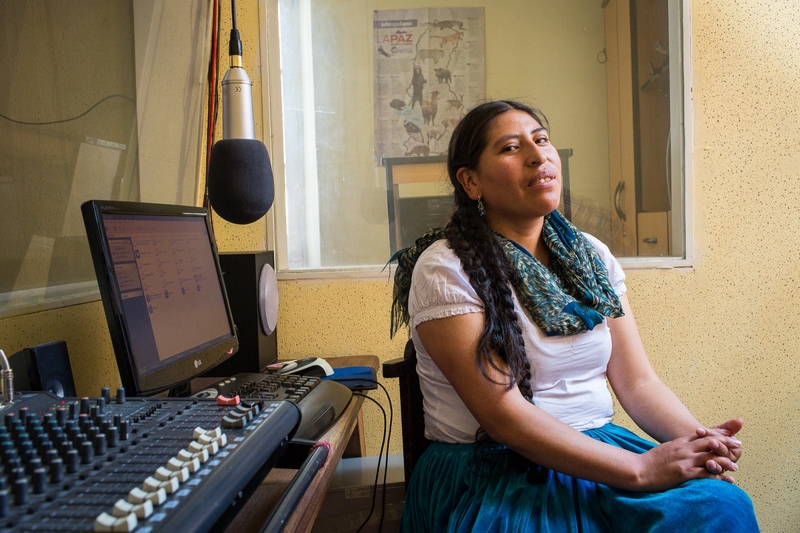 Working since she was 9, she started to produce a radio show in defense of the rights of the cleaners. Being a Cholita and a cleaner put them at the lowest level of the society. The radio program got so much attention that Yolanda and other cleaners create a cooperative where they can set fees and work for the people that they wish without suffering any abuses. 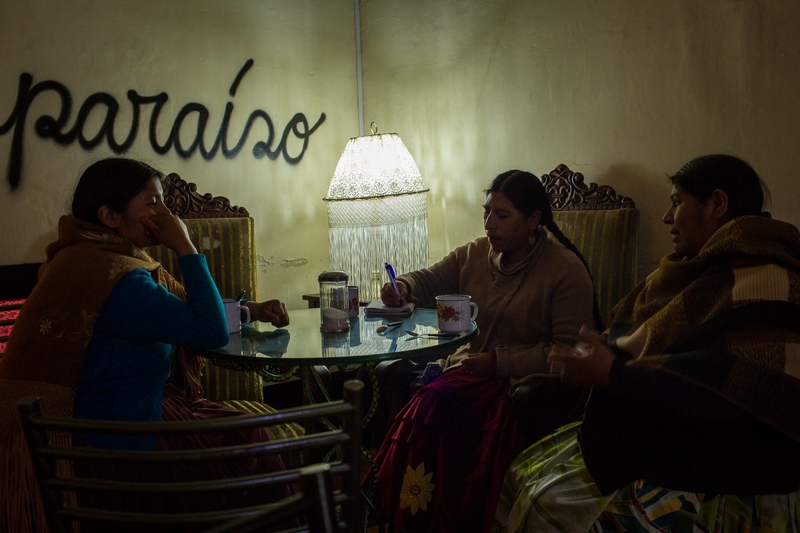 Yolanda Manani with other cleaners during a meeting to set the new goals for the radio program in La Paz. Being a Cholita and a cleaner put them at the lowest level of the society. The radio program got so much attention that Yolanda and other cleaners create a cooperative where they can set fees and work for the people that they wish without suffering any abuses. Diana Malaga in her La Paz store. Diana is the first prominent transsexual “cholita” in Bolivian history, which means she has often had to fight against prejudice on two fronts. She says she embraced her cholita identity in honor of her grandmother, who was a cholita, too. Celia Laura in her classroom at San Calixto Private School, La Paz. Since 2013, students in Bolivia have had to learn Spanish, English, and one of the native languages—such as Aymara or Quechua. Professor Laura, who teaches Aymara, was the first indigenous woman in the country to become a teacher in a private school. There was once a time when “cholitas” were not allowed to study in schools unless they swapped their traditional clothing for Westernized garb. Elizabeth Ramos during a class of the History degree at El Alto Public University, El Alto. Elizabeth is the only Cholita taking the History degree. She is so admired by her colleagues that she was chosen as course representative. Elizabeth faced sometimes discrimination for being an indigenous woman. After finishing her degree she wants to translate texts of history of her ancestors and put them in a book. 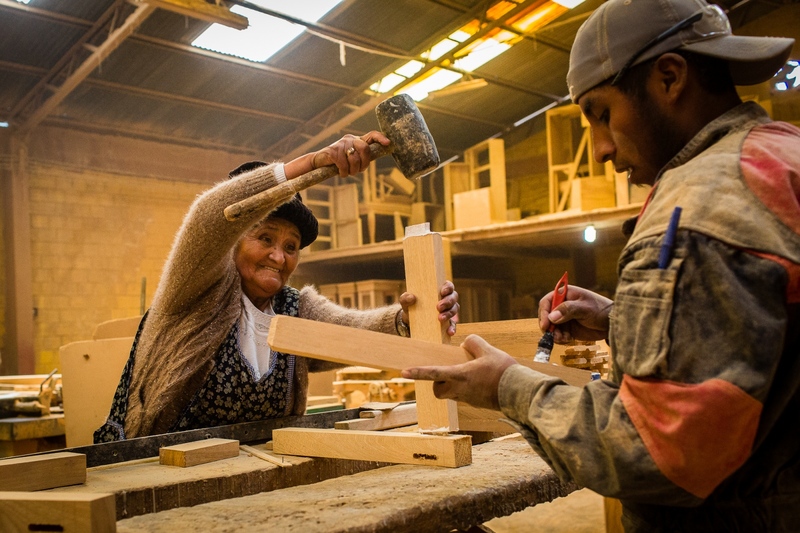 Catalina Silvera fixes furniture in her factory in El Alto. Catalina is a self-made entrepreneur and owns a furniture business which employs more than 50 people. She is no longer deeply involved in the day-to-day running of her business, but she says she still can’t help but intervene if she sees a product which is not entirely aligned with her wishes. Bolivia’s Senate recently recognized her as one of the country’s top businesswomen. 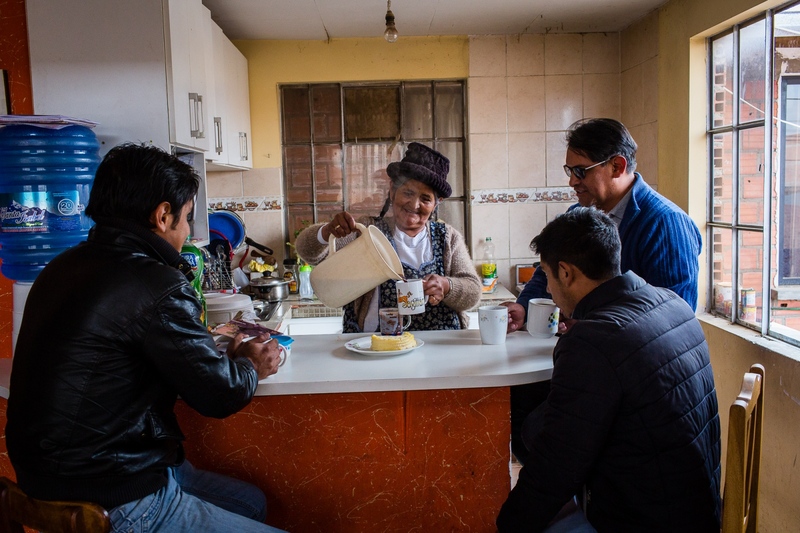 Catalina Silvera pours coffee during a meeting with three of her six sons at the Silvera furniture factory in El Alto. While Catalina’s sons run the daily business, she still makes the major decisions. Celia Ramos opens the curtains in her boss’s room in La Paz. Celia has worked in this house since she was just 14. She credits her boss for supporting her studies and helping her achieve a kind of lifestyle that she otherwise could only dream of. She dreams of bigger opportunities, however­—especially for her daughter, who she’s enrolled in a good school as well as classes for ballet and chess. 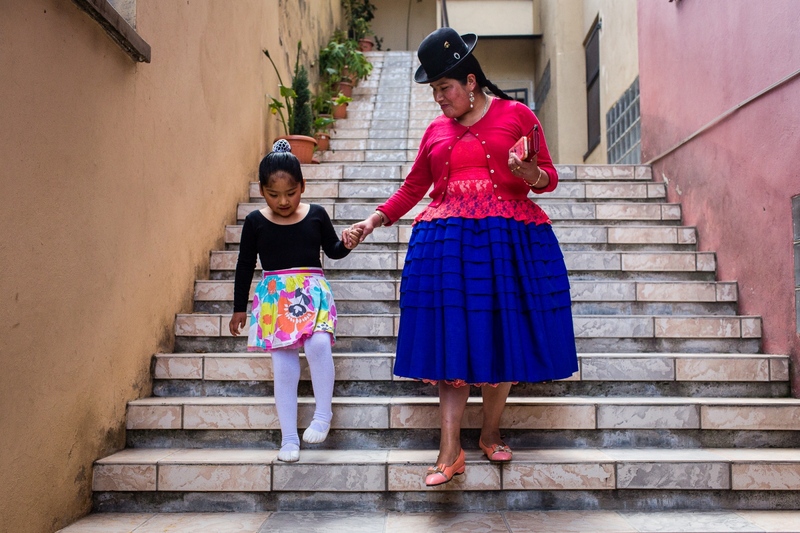 Celia Ramos walks with her daughter after a ballet class in La Paz. Celia works to the same family house since she was 14. She says that her boss gave her a life that she couldn’t dream, by letting her study and giving her a more comfortable life and she thanks her boss for it to the point to call it "Mom". But she dreams of bigger opportunities to her daughter and is making everything possible for her to get it, like make her study in a good school, dance ballet and learn chess. 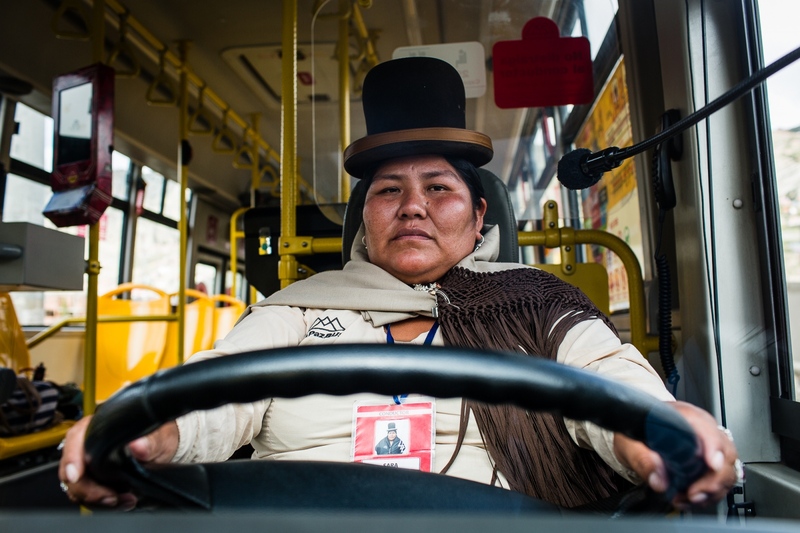 Sara Mamani on the wheel of the bus that she drives daily through the streets of La Paz. Sara is the second "cholita" to ever drive a bus in La Paz. She started to drive first small vans with passengers as a way to make money to feed her children after the separation from her partner, then she went to drive bigger buses. Sara loves it so much that wishes to become an international truck driver; she is just waiting for her children to grow up so she can follow her dream. 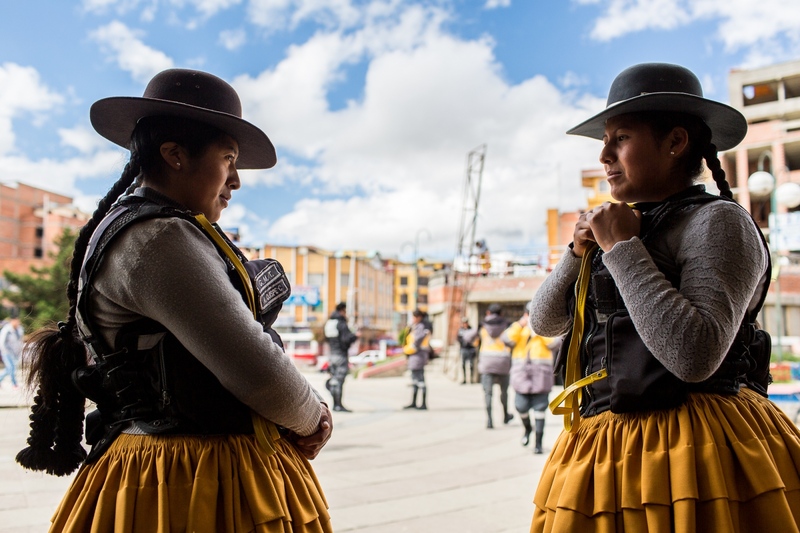 Estela Loyaza (right) talks with A. Quispe, a fellow traffic warden in El Alto. Estela is one of the 15 “cholitas” who work as traffic wardens in the city. Since 2013, the municipality government has been hiring cholitas to control the chaotic traffic of the city. 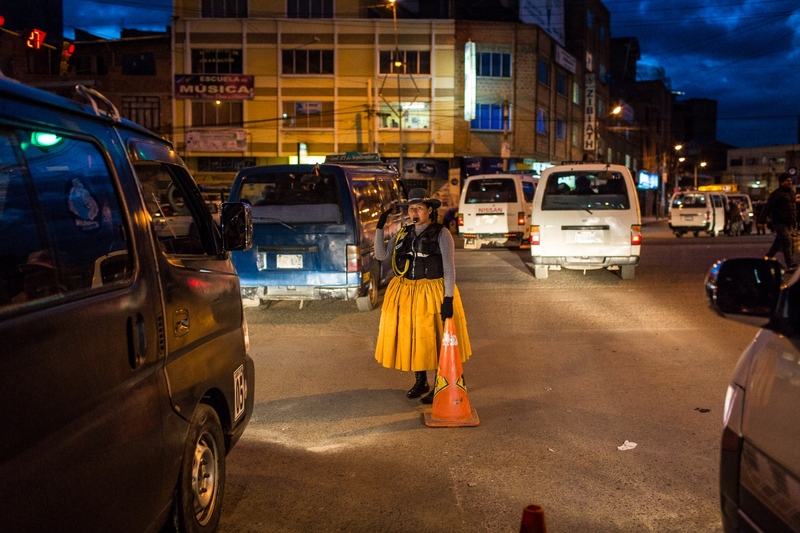 Estela Loyaza, an El Alto traffic warden, at work. Estela loves her job and especially appreciates when people congratulate her for representing “cholitas” in such an important and demanding job. While she plans to enroll in a university one day, she plans to keep working as a traffic warden for the foreseeable future. Silvina La Poderosa jumps from a corner of the ring to land on her opponent, Reyna Torres, during a promotional fight in Senkata, El Alto. After years of dwindling audiences, and in an attempt to revive public interest, wrestling finally allowed indigenous women to participate. The sport’s popularity has since rebounded considerably. 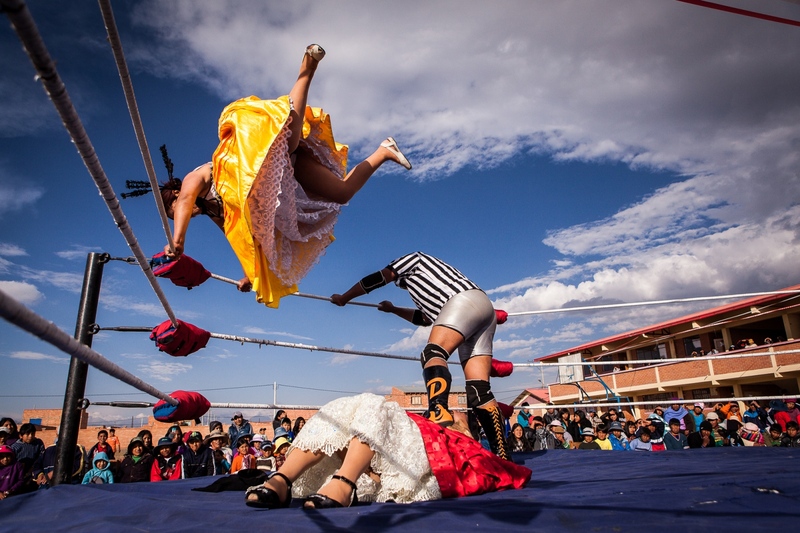 A team of cholitas wrestle in El Alto’s sports complex. 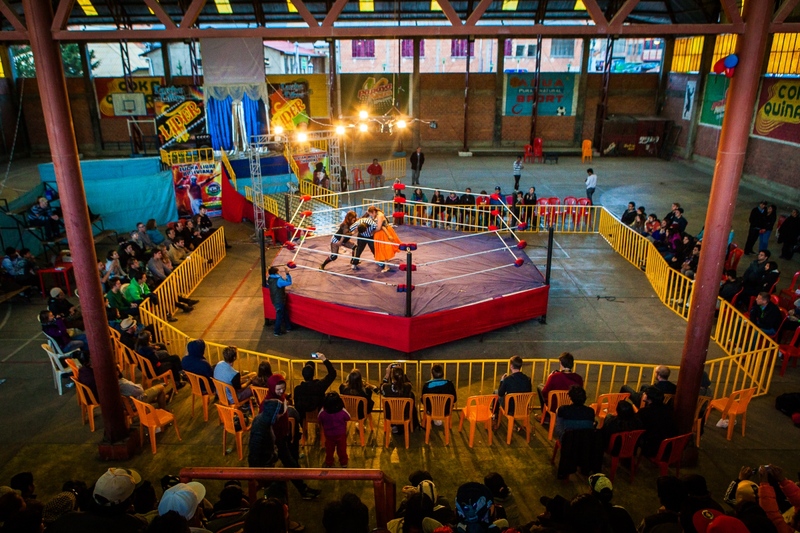 In July 2014, a group of cholitas decided to form their own wrestling association and organize their own events—despite Bolivian mainstream culture’s tendency to enforce a rigid understanding of traditional gender roles. Many of these women have found that their male romantic partners were threatened by female strength; but that doesn’t stop these women from doing what they love. 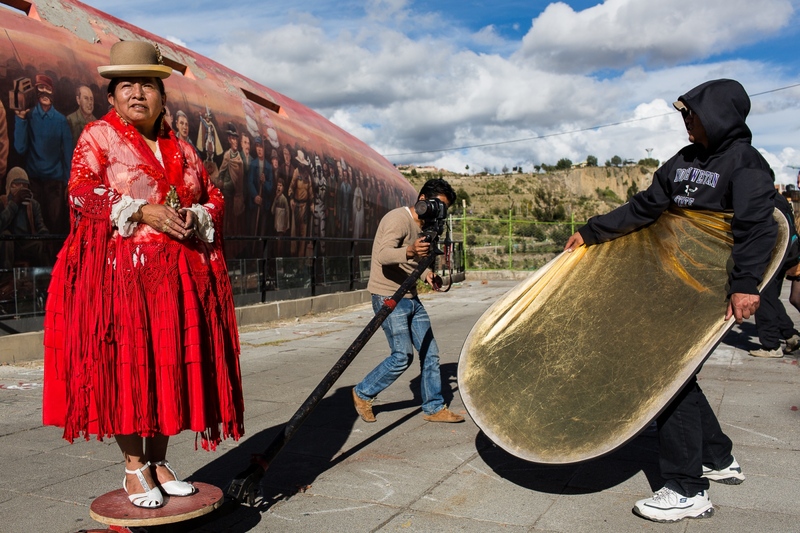 Actress Susana Condori records a music video in La Paz. She says that her childhood was difficult; not only was she an orphan, she was a cholita, too. For years, she says, she struggled to survive. In 2010, however, a friend told her about a casting call for a documentary about Tupak Katari, the leader of an indigenous rebellion against the Spanish Empire. She grabbed the opportunity with both hands—and ever since, she has been following her dream. Two students attend a lecture in La Paz by Rosario Aguilar. Aguilar started a company to promote the work of fashion designers who serve the indigenous market. But after she noticed how few professional models were available or willing to work with her, she started her own modeling school for cholita models. She wants her work to empower indigenous women and help them embrace their culture and identity. Cholitas prepare themselves backstage before ascending the catwalk at a fashion show in El Alto. A model presents a fashion design on the catwalk during a fashion event in El Alto. Indigenous women gather during a three thousand people social reception given by Paco family in La Paz. 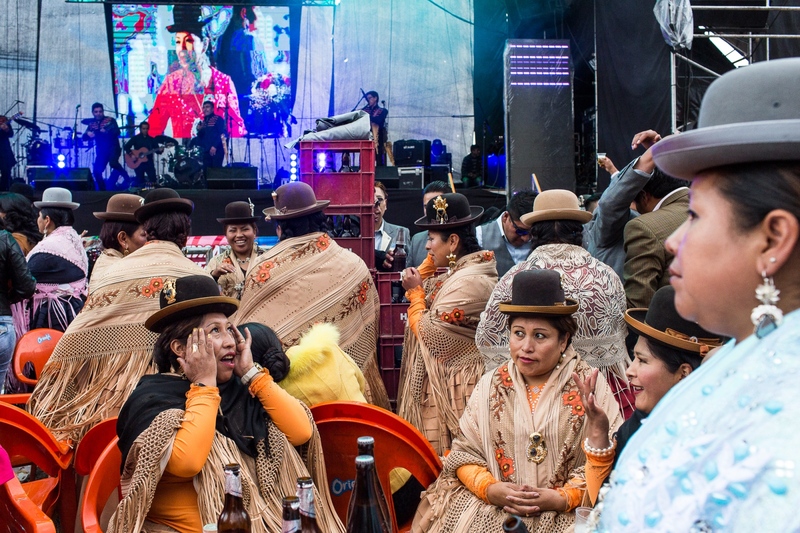 Cholitas and their husbands spend thousands of dollars on parties and social gatherings where there is a never end of alcohol and food, while being entertained by local and international music bands. On the last decade, some indigenous families have grown economically as never before and they use events of this kind as a way to impress their guests and to enlighten their social status and economic achievements. 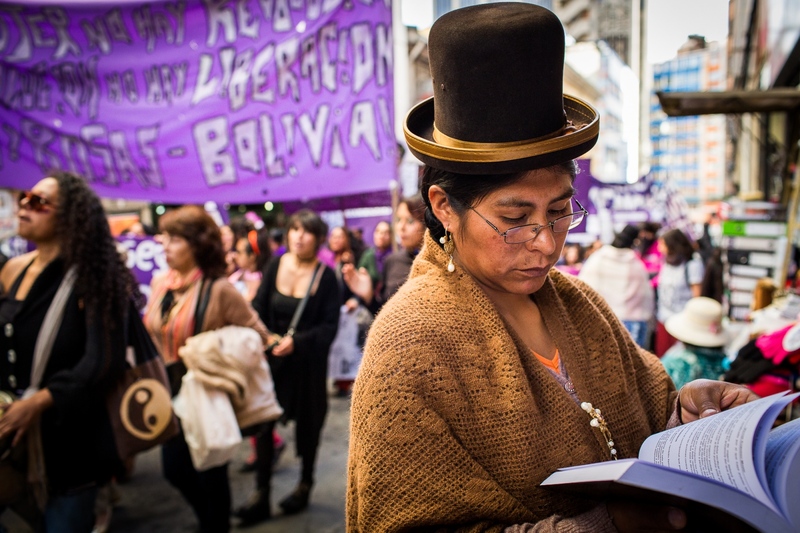 A "cholita" reads a book next to a newsstand during an International Women Day march in La Paz. 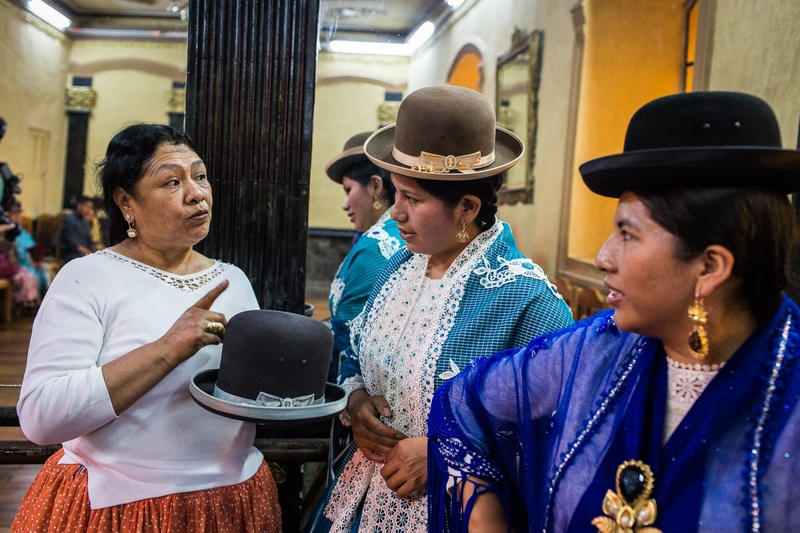 Despite all the progress women have made over the last decade, the fact remains that women—and especially indigenous women—are far from equal in Bolivian society. Issues like domestic violence and access to education are still major problems that will require further investment and dedication from Bolivia’s government as well as from society at large.